“WOW” is the best way to describe John’s cakes! Patisserie Parmentier will design a memorable cake for any event. 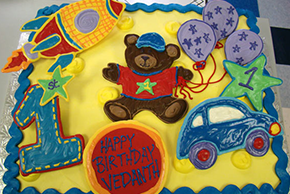 Whether it is your wedding cake, your child’s first birthday or any other important gathering, John and Lisa will help you create a design that will coordinate with your overall theme. Having a Garden Party? Why not try an assortment of flower embellished cupcakes. Graduation cap cupcakes are great for High School or College open houses. A sweet table at the center of the room will draw your guests in, pulling them through a maze of tables just to get a glimpse of what is in store for the night ahead. Nothing compares to the delights at Patisserie Parmentier. Feast your eyes on confections that will make your mouth water. Dream it up, he will create it. These delicious desserts are also works of art. With more than 20 years of experience, Pastry Chef John Parmentier, has created cakes that most people would never imagine. His creativity emerges reflexively. Each cake is a one of a kind, made from scratch with the finest ingredients. How many kinds of cupcakes can you eat? This may become your personal challenge at Patisserie Parmentier. From a bite size mini cupcake to an oversized filled one, it will be hard to decide what flavor or design to choose. The varied selection of miniature pastries can be created to fit any party. John’s abilities are not hampered by the casualness or formality of an occasion. Every function is different and each dessert is created just for that event.